Quad Coil engines for your baby beast. These coils produce fuller vapor at lower wattages but still preserve the integrity of the flavor you are vaping. Not for the super sub ohm crowd but designed for those who love clouds and flavor. 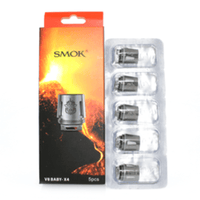 TFV8 Baby X4 Replacement Coils 5 Pack - Smok has a rating of 4.7 stars based on 74 reviews.